We line chimneys that are unlined or reline chimneys that have suffered damage from water, fire, faulty construction, and other types of deterioration and damage. A chimney liner is the best protection to maintain a secure barrier between the smoke and fumes in a chimney and the structure of a home and protect the masonry from the corrosive byproducts of combustion that will extend the usable longevity of a chimney. Call New York’s trusted chimney specialists today at 1-877-952-7425 for professional assistance with lining your chimney or request a Free Chimney Lining Estimate. For over 20 years and counting, we are proudly servicing residential homes, apartment buildings, homeowners associations (HOA), brownstones, and commercial buildings in New York. 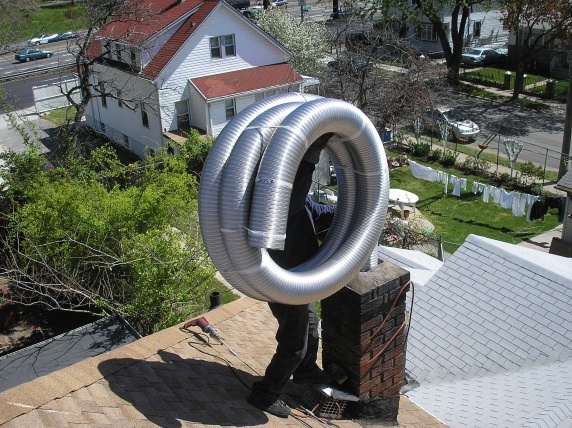 We work with all types of chimney liners: clay tiles, metal (stainless steel or aluminum), and cast-in-place liners. Lining or relining your chimney should only be done by an experienced chimney professional to guarantee that it is done properly to prevent future problems and safety hazards. A chimney liner that is properly installed within the correct dimensions of a fireplace or appliance opening will resolve many smoking fireplace problems and allow optimal performance efficiency of appliances (wood stoves and gas or oil furnaces). Call New York’s most experienced and reliable chimney experts 1-877-952-7425 or request a Free Flue Lining Quote because our chimney lining services will help your chimney stay cleaner, improve burning efficiency of appliances and help save your energy dollars, and provide maximum protection against dangerous fumes, gases, fire damage, and water damage.